Calling psychologists who are interested in the issues of clinical supervision. Do you find that you want to begin supervising practicum students, interns or post-docs and just do not feel like you have enough support to jump all the way in? Are you having challenges or questions about supervising that you would like to connect with other Psychologists in the Sacramento Valley? Do you have other questions surrounding the topic of Psychologists and clinical supervision? Do you wish there was a space to talk about supervision in a comfortable and supportive atmosphere? Have you been supervising for years and want to share your knowledge with other psychologists in the field who are grappling to find answers and support? If you answered yes to any of these questions, this invitation is for you. 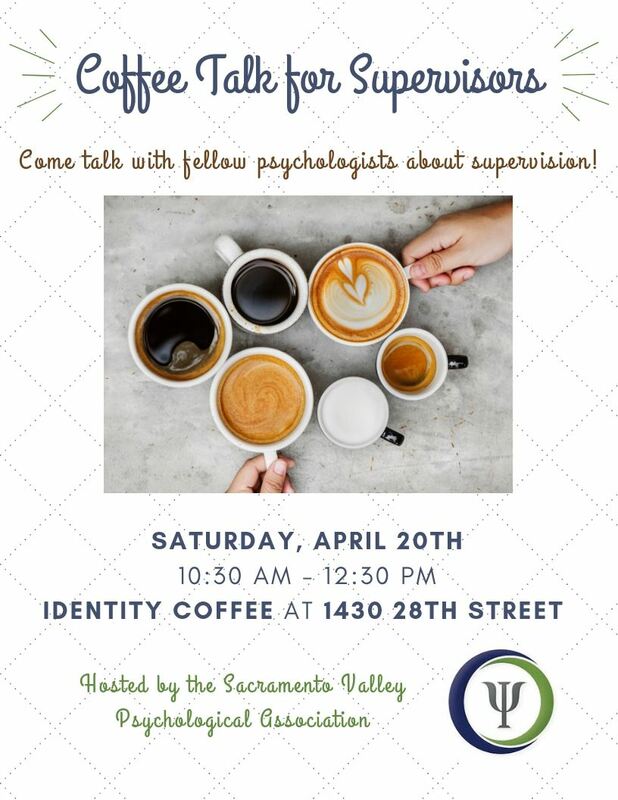 We invite you to an event on Saturday, April 20, 2019, from 10:30 am to 12:30 pm at Identity Coffee @ 1430 28th Street in Sacramento. We welcome psychologists practicing in all settings to share their expertise, experiences, and challenges with others. We will gather to begin important conversations about Psychologists and clinical supervision. We look forward to sharing coffee and conversation with you. Hosted by Dr. Trish Wallis and Dr. Katie Polsky, SVPA Board Members. **Please note that this event is intended for clinical supervisors, and is not a training about supervision or for providing support to supervisee's. We are happy to provide alternative events for training and supervisee needs. We hope to avoid conflicts of interest as much as possible.